Students looking to earn their degree from a criminal justice school in New Jersey have a multitude of career paths to pursue. From making sure underserved individuals are well-represented in court to investigating the cause of crimes and fires, a degree in criminal justice can get New Jersey students on their way to fulfilling careers in the legal and protective services industry. Prospective students can use this guide to find the best New Jersey criminal justice schools, learn about the state’s fastest growing careers and access additional resources to help inform them on various criminal justice fields. After Criminal Justice School in New Jersey: What's Next? New Jersey may look small, but the state offers many colleges where students can earn a criminal justice education. 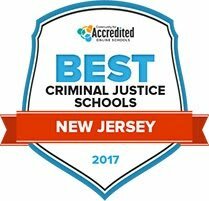 Prospective students can reference this rankings list to find the best criminal justice schools in New Jersey. These schools were chosen based on a combination of multiple factors, like tuition, student-teacher ratio, acceptance rate and total enrollment. Founded in 1965, Branchburg's Raritan Valley Community College serves 7,800 students with more than 90 options in associate degrees and undergraduate certificates. In addition to campus programs, RVCC also offers 125 online and hybrid courses, including general education studies required for two-year degrees. The 63-credit associate of arts degree in criminal justice prepares students for entry into law enforcement professions or serves as the first two years toward a four-year transfer degree in criminal justice. Students learn law enforcement-related computer programs and gain practical experience with participating agencies within the New Jersey criminal justice system. As the only higher education institution in Salem County, Salem Community College grants associate degrees and undergraduate certificates in more than 40 programs of study. More than 1,500 students each semester enroll in programs offered at the Carneys Point campus, the Salem Center, and the Paul J. Stankard Glass Education Center in Albany. Criminal justice students can complete associate degree programs in corrections, cyber security, emergency management or law enforcement. The 62-credit associate of science degree in law enforcement includes a general education component that qualifies graduates for transfer into four-year CJ programs. Camden County College provides students with two-year degree and certificate programs from the main campus in Blackwood, Camden City, and Cherry Hill. CCC also operates the Regional Emergency Training Center located in Blackwood. The criminal justice department offers a 61-credit associate in science degree that can serve as a career-oriented program or prepare students for transfer to a four-year degree program at institutions including Rutgers University, Rowan University, Temple University and Seton Hall University. The curriculum includes studies in technology, policing and juvenile justice. Graduates are qualified for law enforcement entry roles with municipal, regional, state, and federal agencies. Founded in 1966, Cumberland County College serves its 4,000 students in offering 125 associate degree and career-training programs. After completing their associate degree, students can go on to pursue bachelor and master's degrees through the Shirlee and Bernard Brown University Center that maintains partnerships with major universities. The justice studies department at CCC offers curriculum leading to five distinct associate of science degrees, three academic certificates, and one criminal justice career certificate. Associate degree specializations include studies in criminal justice, homeland security, emergency management, forensics, and corrections. The associate programs require a minimum of 50 credits for graduation. Passaic County Community College, founded in 1971, has grown to offer more than 60 associate degree and certificate programs at four campus locations in the county. More than 13,000 students participate in PCCC's campus and online programs. Articulation agreements with four-year institutions make for a smooth transfer process for students continuing past their two-year degree. Criminal justice students can pursue a two-year AAS degree or a 30-credit certificate. Students planning to transfer to a baccalaureate program may choose a 61-credit associate in arts in liberal arts degree: criminal justice option. New Jersey City University's criminal justice program has a unique dual time schedule setup. Classes are delivered at 9:00am and 7:00 pm on the same day, and students can choose which one to attend. This provides working students with a more flexible schedule to accommodate their professional responsibilities. The program includes both classroom learning and field work, and students learn about crime, police administration, courts, and criminal law. Electives offer further training in specific areas of interest, from international crime justice to crime and the movies. The school also houses a career library where students can research graduate schools, careers, employers, jobs, and cooperative education internships. At Monmouth University, students in the criminal justice program are taught by professionals in the field: researchers, psychologists, lawyers, and law enforcement officials. The program provides an experiential education, with a mandatory one-semester internship that gives students the opportunity to bring their newly-learned classroom skills into the real world. Another focus of the curriculum is computers and the technology used in modern criminal justice work. Prospective students considering graduate school after earning their bachelor's may wish to pursue an accelerated program, which awards a bachelor's and master's degree in criminal justice after five years of study. Fairleigh Dickinson University's criminal justice program covers the history of social order and control, crime, the U.S. government, criminal law, terrorism, and political systems. Students also learn about human and civil rights and public policies. Instructors are experienced in the field and come from many backgrounds, with political scientists, forensic psychologists, judges, federal agents, and other professionals leading courses. Many students in the program join the Criminal Justice Club, which brings together like-minded peers for social, academic, community, and volunteer activities. Members raise money for community organizations through fundraising activities, and take field visits to criminal justice agencies from prisons to police training academies. Students interested in earning both a bachelor's and master's degree in criminal justice can pursue Rowan University's dual degree program. The ñ4+1î program combines a bachelor's program in law and justice studies with a master's program in criminal justice, allowing students to graduate with both degrees after five years of study. In both the 4+1 and traditional bachelor's programs, students complete an internship in a criminal justice agency, as well as classes in criminal law and theories of crime. The school also offers a criminal justice preparation club for those who aspire to careers in the field. Rutgers University _ Newark provides its criminal justice students with an understanding of contemporary justice issues and an appreciation for the ethical concerns related to the field. In addition to traditional undergraduate and graduate programs, the school has an accelerated path that combines a bachelor's and master's program. Students complete undergraduate liberal arts coursework in their first three years, and master's-level professional studies for the remainder of the program. Rutgers' criminal justice school has its own academic services department, where students can receive advising on degree programs, course selection, and graduation requirements. Several scholarship and fellowship opportunities are available to students in the criminal justice programs. Students who want a list of criminal justice schools that are more tailored to their individual goals and needs can use this search tool to find the right fit. Search for criminal justice schools in New Jersey by filtering for factors like tuition, student population, acceptance rates and programs or concentrations. Whether graduates are interested in pursuing legal careers, like paralegal work, or protective services careers, like joining New Jersey’s police force, New Jersey there are an array of career opportunities for students who earn their degrees in criminal justice. The table below details the most popular criminal justice careers in New Jersey and the minimum education needed to pursue them. New Jersey is a great place for students studying criminal justice, because many legal and protective services careers are receiving positive growth projections and yielding higher wages than the national average. Check out the tables below to see the most promising careers for those who graduate from criminal justice schools in New Jersey. New Jersey’s highly concentrated population calls for many qualified criminal justice professionals. Perhaps unsurprisingly, most legal and protective services professionals find work in Newark, New Jersey’s largest city. However, other parts of the state also show high employment numbers for criminal justice school grads. Take a look at the map bellow to find which areas of New Jersey employ the most legal and protective service workers and the average wages in each. A membership group of and for in-house legal counsel at businesses and corporations in New Jersey. Members receive event and networking opportunities, as well as job board information. To learn more about regulations and laws for businesses and connect with leaders in the business law community in New Jersey, visit this section of the State Bar website. This official state page provides information about government auditing and financial investigation. See the employment tab for career information. The Northern New Jersey chapter of the national ACAMS organization provides members with career and training information, relevant news and peer support. This chapter of the national professional association provides members with education, training and networking opportunities with the goal of constantly improving the criminal justice system. The main entity for monitoring former offenders as they reenter society in the state of New Jersey. Learn more about the role and responsibilities of parole and probation officers here. This professional association provides information, resources and community for supervisory law enforcement personnel, including Lieutenant-rank correctional officers. Find information about correctional careers in New Jersey, including job duties and open positions. An arm of the State of New Jersey, the Juvenile Justice Commission is the corrections system for youth offenders in the state. Get statistics and facts on juvenile detention and learn more about the field and career opportunities on this page. A volunteer program made up of the Court Appointed Special Advocates that assist children who have been legally removed from their homes because of neglect or abuse. Volunteers help children through court and move onto safe, new homes. This professional association strives to improve the court reporting system in New Jersey. Find education, mentorship and career opportunities along with other informative court reporting news and resources. An advocacy group that focuses on fairness in the civil justice system. From proper use of courts to equal treatment for those on trial, the group works with legislature on court reforms and provides professional development for those in the New Jersey legal industry. New Jersey’s judiciary website provides general and specific information about the New Jersey court system and includes career information and opportunities, publications, programs and other resources. This is the website for the New Jersey chapter of the National Academy of Distinguished Neutrals. Those hoping to become members can find information about the benefits and requirements of membership. The American Civil Liberties Union branch in New Jersey works on cases that threaten civil rights, from freedom of speech or religion to equal rights and privacy issues. The group provides career and internship opportunities locally. The goal of Garden State Bar is to promote and foster African-American attorneys in New Jersey and improve the lives of minorities throughout the state. Started in 1980, this formal group for Law Librarians provides networking and job opportunities, continuing education and professional interaction for librarians across New Jersey. Learn more about workshops, luncheons and more here. This professional association aims to promote and increase diversity, education and advocacy within the New Jersey law system. The site provides a variety of information for law professionals. The NJWLA aims to further the advancement of female lawyers in New Jersey. Stay up-to-date with news and find education, career and networking opportunities. A volunteer group of legal professionals designed to offer pro bono legal services to non-profits. The group serves New Jersey, New York and Connecticut and has information on volunteer opportunities on this page. Founded over 150 years ago, PANJ aims to serve as an advocacy group and an information hub for New Jersey probation officers. Learn the ins and outs of Law Enforcement careers in New Jersey. Members of this professional association can access professional development resources, connect with other members and stay current on relevant news and events. This association is appropriate for any New Jersey law enforcement professional, regardless of title. The association represents its members in legislative issues and works to promote cooperation and advancement between law enforcement agencies. The official website for New Jersey’s police force provides law enforcement, recruitment and other information prospective police officers may find useful. This branch of New Jersey’s Department of Environmental Protection provides information about fish and wildlife laws, events, internships and careers. This comprehensive professional association provides information about animal control careers, certification, education and other relevant news. This New Jersey chapter of the national association is a great resource for established and prospective arson investigator professionals alike. Stay current on local arson news and find education and training opportunities.